When searching for a location for a pre-baby lady lunch, I found it difficult to find something that was outdoors but undercover, had drinks, food and great non-alcoholic options AND was central so people could come from all corners of the city. Another friend suggested Elixir Rooftop Bar in the Valley and on looking at their website, it looked like the perfect spot. We arrived at 1pm on Sunday when the doors opened and were able to pick a seat in the shade as it was bright and sunny. The tall tables had sturdy wooden stools at the tall concrete slab tables. There was also some low seating and tables just beside which was perfect for our pregnant host. Being so close to the busy streets of the Valley, it was a surprisingly tranquil sanctuary with water features and soft music. It felt like you could be in a beautiful Mediterranean bar with the beach only metres away instead of the middle of a bustling city. Our bartender was attentive and made beautiful cocktails for our party and the ladies who weren't drinking were treated to refreshing, fruity mocktails. We ordered a variety of tapas dishes including dips, olives, pita chips and slow cooked chicken wings. The most beautiful dish was a toss up between the Roasted Kipfler Potatoes w' Chipotle Aioli and Braised Shallot and Goats Cheese Tarts. Everyone paid around $10 each and all left sated and happy with the food we were able to purchase with that money. 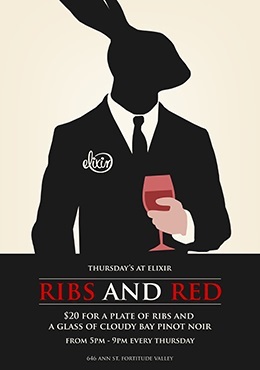 Elixir have a few great meal deals which I will be heading back for in the future. On Sunday you can get a Cider and Slider meal deal for or on Thursday nights they have their Ribs and Red meals for just $20 a plate of ribs and glass of red. The story of the naming of the bar comes from Chinese Folklore whereby a 'Moon Rabbit' sits on the moon and pounds ingredients for the elixir of life. 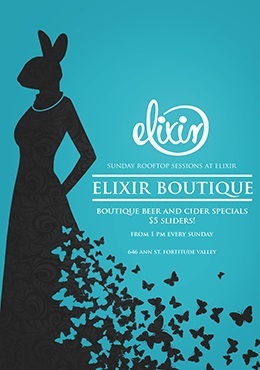 Elixir believes they embody the the rabbit and have used it's image for all their advertising and signage to signify their creation of unique cocktails and going above and beyond to give the perfect experience for their customers. I would agree that their philosophy shines through as we had a beautiful experience and will be back again soon.